This color is so stunning on you and I LOVE those sleeves. Perfect for Mexico! Also loving how you styled your hair with it! Frill FABULOUS!!! I fell hard when I saw this, so incredibly fun and WOW, do you ever rock red!! I mentioned you in my post today and it’s a link-up, come on over and link-up cause this outfit is a MUST SEE that you have on!!! You look Marvelous my love!! Amazing dress!! You look so gorgeous with it!! Those sleeves are absolutely gorgeous and so is this shade of red on you! LOVE this dress! OMG that bag, those sleeves, your earrings! I am not sure what I love the most! Can’t wait to read all about your tip! Such an amazing dress! Love that color on you! those sleeve frills are everything and you look beautiful! Gorgeous babe! I love red dresses and the frills ad sleeves on this one are gorgeous. The clutch is perfection too! These sleeves! What a cute dress for Cabo, Shauna! You are just like the girl in the red dress emoji…I’ve been dying to use that on IG so I’m super jealous haha! So perfect with those fun earrings too! Have a great week! Love the red and Love the sleeves..what a fun dress! You have the knack for finding such fun outfits! Your earrings are always the perfect match too! OMG swooning over this dress! Those sleeves and those earrings… you look absolutely amazing! Hope you’re having a blast in Cabo! lol tan lines–this dress-so cute!! Reminds me of the dancing emoji!! Of course, much better! This dress was made for you Shauna! 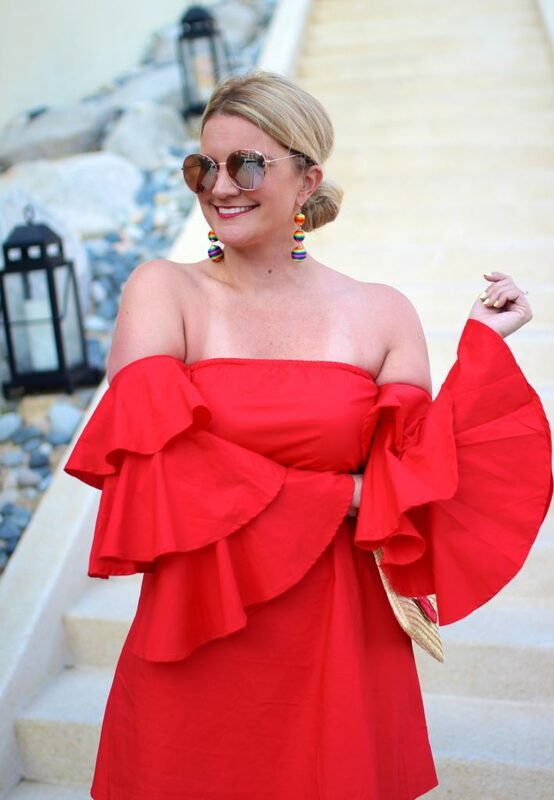 I love the bright red and the sleeves – you look gorgeous! wow you look stunning in this red dress, love the sleeves, so pretty. Wow this dress is absolutely beautiful! You look great and I love that clutch! Such a fabulous dress! Looks fantastic on you! Looks like an amazing trip! I love those sleeves and the colorful earrings! I cannot get enough of these sleeves & that color is soo gorgeous on you!! What a stunning outfit! That dress looks amazing on you, it’s so perfect for a beach vacay and I love the ruffles! Shauna…your fashion sense is just impeccable!!! 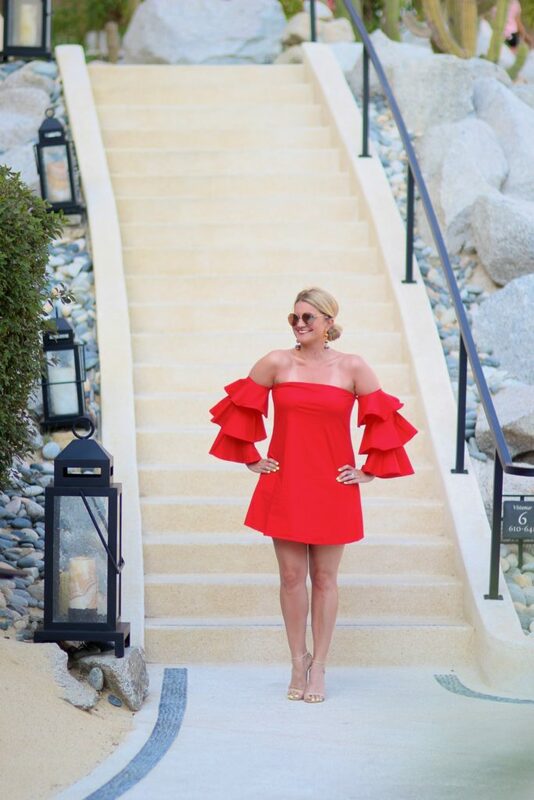 You look fabulous in this red dress and I just love the fun, frilly sleeves! I hope you had the best vacation ever! Girl, how gorgeous are you? That is a fun dress and a statement one at that! You rocked it effortlessly! These ruffle sleeves are so gorgeously dramatic! I feel like you need to start salsa dancing immediately! Hope you enjoy vacay! Nice dress.So hot and lovely.I love the off-shoulders on you. Omg this dress is just perfect and looks amazing on you. Really, is it this stunning? I mean your look. What a dress and how awesomely you are carrying it. Lovin’ it to the core GORGEOUS!! Such a fabulous outfit! That straw bag with the wink is too cute! You are a vision in red!! This dress is gorgeous and of course you have styled it with the most fabulous clutch. Beautiful Lady! How sassy are you in this red number?! I love it! Wow! You look absolutely stunning, Shauna! Love that fabulous dress!! Red is definitely your color! Girl, your dresses this summer are giving me life! I need this one in my closet asap!! I lovee that gorgeous red color on you! I love the color and sleeves! That is an incredible statement dress with those amazing sleeves! You look fabulous! Me encanta el vestido!! Es perfecto! Y el color te sienta genial!!! Okay when I saw this on your insta I was like OMG best dress ever! You can pull off this look and make it look chic girl! How pretty you look in your red dress. OMG this dress is awesome…those sleeves are killer and so perfect with that clutch! Girl!! You look so stunning and chic! This dress was totally made for you! This dress is so fun! I love the sleeves and the red is beautiful on you. Ha, I didn’t even notice your tan lines until you mentioned them! You are so vibrant in this dress! I was too distracted by your dress to notice the tan lines! The sleeves on this dress are just amazing! Love this outfit so much! What a gorgeous dress – so perfect for a summer vacation! Enjoy the rest of your stay. How amazing and fun is this dress! It looks so good on you and must have been perfect to wear in Cabo! Hope you’re having a great week! Looking super fab in these frills pretty lady!! Enjoy every minute in Cabo, we are going to the Mayan in July and can’t wait! What a stunning dress! Love how you styled it with the clutch. Too beautiful! How did I miss this fab outfit this week! Holy cow, I’m in love with that dress! Have so much fun in Cabo! That dress is just stunning. That’s great to hear about the sleeves and neckline staying put!